In the face of the enormous devastation that is destroying forests across northern Alberta, a peaceful group of people are steadfastly asserting the need to heal the land and waters. On June 25, 2011, the second annual Healing Walk for the Tar Sands occurred, bringing together Indigenous people, Keepers of the Athabasca, elders, children, and supporters, who walked 13 km through the heart of where Syncrude and Suncor extract bitumen on a massive scale. 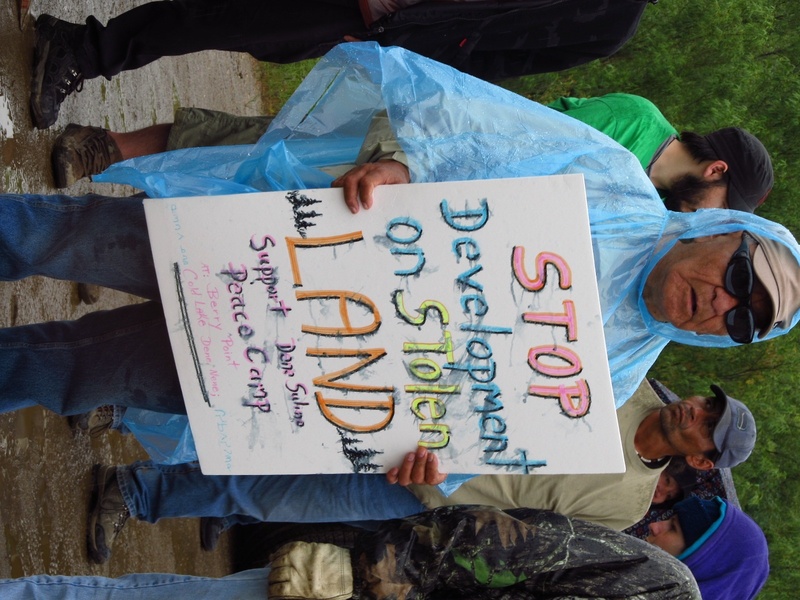 The Tar Sands ealing Walk was led by elders such as Lillian, a Cree woman, and Violet, an 83-year-old elder and the oldest woman in the community of Fort McMurray First Nation. These elder women possess a wonderful sense of humor and sharp minds, and with other elders, guided the traditional prayers, smudge and ceremonies. This walk faced the enormity of the land stolen from Indigenous peoples that is now destroyed, lifeless, and empty save for ugly scarecrows called “bit-u-men” to keep out the birds from its poisoned soil. Horrid continuous booms from sound cannons scare the birds from landing in the enormous reservoirs of toxic waste. We marched beside the machinery of destruction, the surreal gigantic Tonka trucks, cranes and pipes. The air pollution, a putrid stench, gave a headache to many of the people who participated in the healing walk. The day was rainy, with occasional bursts of sun, but the walkers were not deterred by the weather. A couple walkers had brought protective dust masks, remembering how terrible it felt last year after the 6-hour walk, their lungs absorbing toxic dust from the tar sands. However, it was not appealing to wear wet masks so we continued, mostly mask-less, through the rain along the shoulder of Highway 63, accompanied by a heavy police presence. This walk was started by people heartbroken by what has happened to their traditional homelands. One of the organizers, Cleo Reece, helped to start the Memorial March for the Murdered and Missing Women when she lived in Vancouver years ago. She spoke of the murdered and missing waters in northern Alberta, an eerie, disturbing connection between the violence against Indigenous women and against Indigenous land. Colonization is not a thing of the past; it continues today in virulent, violent forms and materializes in the increased rates of cancer found in communities downstream from the Tar Sands. Resistance and commitment to peace also continue, as they have for the past 500-plus years. This is a form of power that is based in love for community, a community of the living that includes not just people, but bears, eagles, rivers, wind and forests. It is a deeply humble, peaceful power that stands in ethical contrast to the forms of power that greedily exploit and forcefully violate the land and those who live on it. It is a power that cannot be bought or sold because it is freely shared, residing in a respect and a grief for the land that gives us life. We began and ended the day at the Nistawoyou Friendship Center in Fort McMurray, where there was an amazing feast for the walkers afterward, prepared by a chef with a joyful laugh and a team of dedicated volunteers. At the closing circle, Cree Elder Lillian Shirt was presented with tobacco in gratitude for her leading of the day’s ceremonies, and she shared with us amazing stories of survival and creativity. We learned a lot from going to the Tar Sands Healing Walk and from visiting the surrounding Indigenous families, some who live in crowded old trailers, accessible by unpaved, muddy roads. The living conditions on some of the reserves are not unlike those that one can witness in Latin America among poor communities. Where are the economic benefits of the Tar Sands to these communities? What have they gained from these industrial projects? Witnessing the poverty, health problems and environmental destruction in person helped us to respond to these questions. There is a huge economic gap between the living standards of predominantly Caucasian areas and those of Indigenous communities. These communities are marginalized in Canadian politics and are fighting institutional racism as their long-term interests are undermined. At the walk, an elder weighed the cost of lost culture, water and foods and asked what all this destruction has been for. The question points to the global interests that have developed the Alberta Tar Sands in order to sustain a privileged way of life for some at the expense of others. We had travelled from Vancouver, a dramatically different landscape than the Tar Sands wasteland that is nonetheless endangered by its economic grip. Our Pacific Coast is threatened by proposed pipelines, with their inevitable spills, and a rapid increase in tanker traffic. In an era of climate change, those of us who live in urban centres cannot afford the disconnection between our cities that reap the temporary benefits of this destruction and the Indigenous homelands that have been desecrated. Through global waters, winds, and ethical human relations, we are linked with the people who are witnessing the eradication of their boreal forests, traditional hunting grounds, and once pristine waters. On the edge of the dead land and toxic reservoirs, there are wild flowers, forests, Indigenous families living in trailer homes. Life here is simple, humble and warm, filled with good humour, jokes. Inside Indigenous artwork on the walls portrays wolves, traditional carvings, pictures of ancestors and grandchildren. In this community, women, men, children, youth and elders resist their displacement and speak up about the destruction of their land, water and wild life. “Giving up is not an option,” said Dene Suline Elder Warrior Brian Grandbois from Cold Lake, Alberta. Brian’s community is struggling to protect Berry Point at English Bay in Cold Lake, the land where they have ceremonies, sacred burials, smoke fish and gather medicinal plants. This sacred land is threatened to become an RV park by ministerial order. Indigenous peoples of the area have set up their peace protection camp with tipis, tents and campfires, even though police are pressuring them to leave. Colonialism, Eurocentrism, and capitalism are killing Indigenous peoples, destroying our planet, La Pachamama – our Mother Earth. That the pollution from Tar Sands extraction projects has spread to affect the waters of the Athabasca River and Fort Chipewyan is no secret. Beginning in the 1990s, these waters became unsafe to drink, and people now become sick as a result of the toxicity of the water. These polluted waters empty into the Arctic. This is a fact of hydrology. 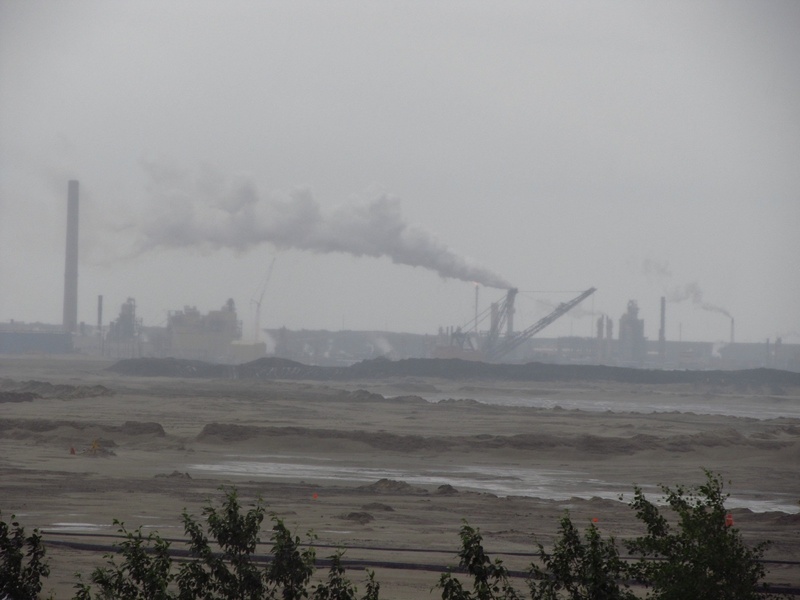 Tar Sands pollution as a source of acid rain in Saskatchewan is a meteorological certainty. Airborne pollutants are also reported to be concentrating in lake water in neighboring Saskatchewan, reducing the availability of certain fish species. While the ailing of these once healthy waters is cause for alarm, corporate negligence has been responsible for at least three recent pipeline spills in Canada and the US. In July 2010, Enbridge spilled 3.1 million litres of oil into Tallmudge Creek and the Kalamazoo River, Michigan. In May 2011 in the Plains Midwest, 4.5 million liters of oil were spilled in Lubicon Lake Cree territory, the homeland of Melina Laboucan-Massimo, a young woman from the Lubicon Cree Nation who spoke eloquently at the Friendship Center. She attested to the horror of experiencing 28,000 barrels of oil spilling right beside her family’s homes, in the largest oil disaster in Alberta since 1975. In June 2011, Enbridge was also responsible for about 1,500 barrels spilled near Wrigley in the Northwest Territories. This last spill is said to have been kept out of waterways, but still seeped into the soil. Horrific spills are not the only danger posed by industrial activity in Northern Alberta. In December 2010, a gushing saltwater aquifer at Shell’s Muskeg River operation raised questions about ground water contamination. This incident was preceded by another round of duck deaths in October 2010 in a Syncrude tailings reservoir. It’s a tragic irony when cultures that see water as something that comes from a tap have to learn about the interconnectedness of the earth’s waters through violent corporate operations that destroy Indigenous people’s homelands and cultures. 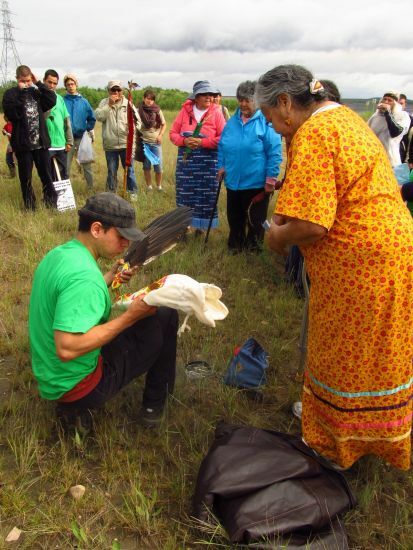 The Second Annual Healing Walk in Alberta’s Tar Sands was deeply inspiring. In the midst of massive greed and destruction, a community gathered to transform ground zero into a place of solidarity and social change. The call for healing is compelling, as simple and as necessary as breathing clean air and drinking clean water. The walkers shared an understanding – respect for ecological integrity must come first.